Copper is malleable. That is, it can be bent and shaped without cracking. It can be rolled into sheets. So, it is easy to make copper gears of various shapes. It is a ductile metal and can be easily drawn out into thin wires. Copper is resistant to corrosion. It offers high strength to the gear. It is easy to machine copper gear. Copper can alone be used to make gears or at times can be mixed with other elements like zinc and tin. Copper and zinc makes the alloy of brass; copper and tin makes bronze. Bronze with copper offers low friction and high strength. It is widely used for power gears. 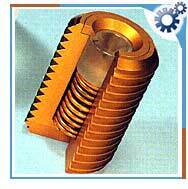 Copper is a good conductor of electricity and so copper gear result in spark proof starting of the engines. For transporting various oils such as petroleum, diesel and lubricant oils, copper gears can help oil pumps to convey fluids with low flash points such as gasoline and benzene at temperature below 70°C. Copper gears are used in semiconductor industries, in radiators, clocks, paper making, printing, aerospace and mining industries. They are also used in electric motors, trucks and air brakes.